While fatigue is often difficult to manage studies show that fatigue does contribute to many workplace problems such increased accident rates, absenteeism, and more accidents. 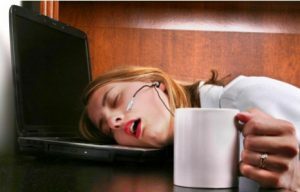 Therefore it is essential that all employers regardless of the type of business they operate gain insight into the causes and effects of fatigue in the workplace and learn how to prevent and manage workplace fatigue. Workplace fatigue can be caused by situations that occur both in the workplace and outside of it. While there is little that you can do to ensure that your workers get sufficient rest at home there are a variety of things you can do to help prevent and manage fatigue while workers are on the job. ・There is sufficient lighting with which to perform all tasks. Inadequate lighting causes eye fatigue and eventually tiredness in many people. By ensuring that your employees have a well lit environment you help to reduce the chance of this type of fatigue. ・Noise levels are reasonable. Studies suggest that workers who are subjected to long periods of loud noise often experience fatigue much faster that those employees who work in an environment where noise levels are reasonable. ・Temperature levels are controlled. Working in places where the temperatures are high can induce sleepiness and also make workers feel tired faster than when they work in a cooler environment. While you don’t want your employees to be cold, maintaining slightly cooler temperatures will help reduce feelings of fatigue. ・Workers get to switch up those boring tasks. Some studies show that employees that are subjected to repetitive, boring tasks become fatigued faster than employees who have interesting tasks to perform or who are moved from task to task. If your work requires workers to perform repetitive boring tasks switching up these tasks among workers helps to manage fatigue. ・You provide your employees with adequate breaks and encourage them to eat small healthy snacks during break times. When employees eat healthy snacks during break times they are more likely to maintain their energy levels throughout the day. This helps to prevent feelings of fatigue as well as giving them a short rest period from those tasks that require sustained levels of concentration. Employers who learn to prevent and manage fatigue in workplace enjoy a number of important benefits. These benefits include higher production rates, less absenteeism, less damage to machinery and equipment, and fewer accidents. This results in increased worker satisfaction, fewer repairs and less downtime and a higher profit margins. By providing the kind of environment that helps to reduce worker fatigue, learning to recognize the signs of fatigue and learning tricks to help workers manage their fatigue before it becomes a problem, you are providing your workers with a safer work environment and your business with the ability to turn a profit.